One of the perks of no equipment workouts is that you can do it literally anywhere. Whether you are traveling and need something to do in a hotel room, or you want to spend time at the park but also get a workout, these moves will be easy for you to get in a good workout. Both planks and push-ups are hard to do and excellent no-equipment workouts, but why not combine them? This gives you the extra ab work when holding the plank while giving you even more resistance for a good arm workout when you’re doing the push-up. The main difference is that with a plank, you are holding it for a number of seconds, while push-ups are constantly moving up and down. Try holding a plank for 10-20 seconds, doing a push-up, then holding the plank again. Continue doing this for as many reps as you can. Lunges are also commonly recommended as a no equipment workout, but you can go one step further by holding weights while you do them. This turns a lunge into a full body workout that is also increasing how much fat you burn. When you add weights, the extra muscle power is really going to help you burn more fat. You can hold your arms at your side while holding weights, or try lifting your arms above you while holding onto a kettlebell during the lunges. This can also be done when you are doing squats. Jump squats are excellent for a High-Intensity Interval Training (HIIT) workout, where you want to burn fat in a shorter period of time. You are going to combine squatting and jumping in the same movement. Stand with your legs shoulder-width apart, then go down into a squat. When you come up, you want to do a jump to where both feet are off the ground, then back down into your squat. When it comes to getting fit and feeling good, knowing what to do and finding the time to do it is more than half of the battle. Eliminating the hassle of gym memberships, SHAPE editor-at-large and celebrity trainer Jay Cardiello lays out a fool-proof 12-week plan to show readers how strength training can help them get into shape and burn fat. 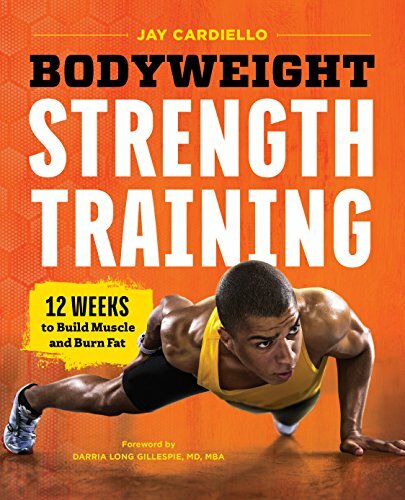 With essential exercises for your legs, back, abdomen, and arms, plus easy-to-follow workout plans that suit any schedule, Bodyweight Strength Training does the heavy lifting for you. Strength training exercises include: Sumo Squats, Scapular Holds, Torso Twists, Push-Ups, Triceps Press-Ups, and much more! A proven track record for success with professional athletes and celebrities alike, Jay Cardiello shares his strategy here to help you get strong and stay lean. Its Time To Get Fit!